Motocross Hideout – Page 2 – Tips, reviews, and secrets for riding and maintaining dirt bikes. Is the Honda XR200 a race bike? No, but it is a reliable, torquey, lightweight, easy to ride, and simple trail bike that is great for tight and technical riding. It may not be the best at anything in stock form, but it does a lot of things very well in the off-road scene, and let me tell you, it is a BLAST to ride! The XR200R started out with decent suspension back in the 80s that was adjustable and fully rebuildable, but went downhill in the 90s until Honda stopped importing the bike to the U.S. in 2002. The XR200R was featured as the Used Dirt Bike of the Month in July of 2013 here on Motocross Hideout. It briefly goes over the pros and cons of this bike, but now we will go over some real mods and tricks to make your current or future XR200 rig a force to be reckoned with. It’s hard to find used ones in good shape, but with some TLC, along with a little bit of money thrown at it, you can be spinning laps through the woods in no time! First thing to look at is the suspension. If you weigh over 150 pounds and are aggressive at all, the stock suspension on any year XR200 is under-sprung, as well as under-damped. 1981-83 had single adjustable shocks and 1984-1991 were fully adjustable. After that, Honda stuck on a cheap, non-rebuildable and non-adjustable rear shock, along with shorter forks. Both combine for a lower seat height and an even lower performing trail bike. While it may have the same power-plant throughout the years (except for the ’84/85 RFVC 4-valve engine), many people base the XR200’s capabilities off of the ’92 to ’02 because there are more of them to be had on the used market. The stock shock on an ’84-’91 (84-85 XR250 shocks are the same and will bolt on) are surprisingly good, and much better than the non-adjustable shocks on any of newer XR200’s after being rebuilt. They’re not too hard to find on eBay, but a lot of them are in rough shape. You will want to service it at the least. A new head seal kit is a good idea, and if you really want it to perform better you can send it out to get re-valve for your weight and riding style. This is the best bang for your buck, but if you want the highest performance, a Works shock will cost you a hefty 500 American buckaroos, give or take. While it’s a great upgrade compared to the 92-02 stock pogo-stick shock, it may not be worth it if you’re on a budget and don’t need a full-on race machine. Much like the shock, the forks were downgraded on the Honda XR200R after 1991. They were not adjustable, and they lost some much needed suspension travel; thus lowering the seat height. This was done to make it more of a ‘beginner bike’. It’s not difficult to swap out the internals to bring the travel back up, but it’s just one more thing to do. The best forks from an XR200 are on the 1986-1991 models, and they can bolt right on to the later model 200’s. However, this isn’t the only option you have (more on this shortly). If you get the early model XR200 forks, you can get stiffer progressive springs that can handle heavier and more aggressive riders and are fairly inexpensive. Servicing the forks and putting some heavier weight fork oil can help slow the damping down, which is probably the weakest point of any stock XR suspension component. If you want to spend a little more time and money, you can swap out the stock forks from with a set from another bike that has better/bigger forks. 1984-85 Honda XR250R forks are bigger, but they require the complete front-end to fit on an XR200. If you go this route, you will also get a much needed front disk brake upgrade. They only have 10 inches of travel (same as the early XR200), but the internals are beefier so it can take more abuse. A step up from that would be the forks from a 1986-1995 XR250R. They have 11 inches of travel and are 41mm in diameter, compared to the stock 36mm on the 200R. They have a disk brake as well and will require the complete front-end to work on the XR200. If you do this swap, the front end will be higher, causing a difference in bike geometry and the handling with change. To combat this you can pull the forks up in the triple clamps, or change the rear-end height with a different shock/linkage that will raise it up to level the bike back out. Another common swap, and probably the best bang for the buck if you can find a cheap roller, is swapping a front-end off of a late 80s Honda CR125/250R motocross bike. They aren’t inverted forks like modern MX bikes, but they are cartridge forks that perform a lot better than the stock conventional damper-rod forks. They also have disk brakes that are leaps and bounds better than the XR brakes. These aren’t technically a ‘bolt-on’ swap, but a specific height for a spacer is the only major part you will need to ‘fabricate’. These forks will definitely raise the height of the front-end, so you’ll want to move the forks up and/or compensate with the rear suspension or else the handling will suffer. I could go on for quite some time about suspension mods for this bike, but I’ll let you decide and continue the research if needed. I wanted to cover suspension mods first because “go-fast” mods won’t help much when you’re bottoming out on braking bumps with a stock suspended XR200. The intake, as well as the exhaust, are rather choked up on almost every Honda XR from the factory. You may not want to do every single modification depending on your riding conditions because some of the OEM parts are designed to protect the bike from possible failure. The airbox helps keep the air filter clean from dirt and water, but there’s very few openings for air to get to the filter. By “opening it up”, it will allow more air to flow through the carburetor, resulting in a noticeable increase in throttle response and power. To do this, the best way is to remove the snorkel on top of the airbox. Just remove the top cap part and keep the other piece that has the three ducts/openings. More water can get in if you ride through mudholes, but it’s still protected because you’re just opening the airbox on the top. Another intake mod is replacing the stock filter with a bigger and more free-flowing air filter. This will let that new air actually reach the carburetor and use it to make a little more power. If everything else is stock, you shouldn’t have to re-jet the carb because the XR200 comes rich from the factory. This is another modification that may require some compromise. If you need your XR200 to stay quiet because of neighbors or rules/regulations, you probably won’t find anything quieter than the stock exhaust. You can pull the baffle out for a good improvement in throttle response and low-end torque. However, it will be considerably louder. The stock head pipe also restricts the bike, so replacing it with a larger diameter aftermarket pipe will yield noticeable horsepower gains throughout the RPM range. XRs Only sells a stainless pipe that is meant to go along with their silencer. I have not personally tested this head pipe with the stock muffler, so I do not know if it will bolt on due to the larger diameter (however, this is on my to-do list and I report back when I find out for sure). You can look for a supertrapp exhaust, but the consensus is that this is quite a bit louder than stock as well. If you want to be stealth, then the complete stock muffler is the best choice. On the other hand, a number of XR200 owners have swapped out the baffle that is held in with the bottom two bolts for the stock baffle from an early to mid 80’s Honda ATC 250R. It is not much louder while giving you back the performance similar to running it without a baffle due to it flowing better. If the engine starts and runs strong without smoking, it’s probably the last thing I’d look at as far as mods. Why? Because it’s the most expensive, and the other mods should be done first to “un-cork” it. If you really want to add some torque and horsepower, there’s still some room for improvement in the cylinder and head. A hotter camshaft alone will make a good increase in power. However, the more radical the cam, the more supporting mods you will need to make it worthwhile. These mods may include an aftermarket exhaust, a high compression piston, better valve springs, and may possibly require some more piston clearance if you go really big. There’s over-sized pistons, but if you bore the cylinder too big, reliability will be compromised. A stroker crank is also an option if you can find a shop that still does it for the XR200 engines. The 218cc stroker will mainly increase low-end and mid-range torque, so it’s a great mod for trail riders and those who don’t rev it out much. Powroll supposedly still does work for this bike, but you will have to call and see what they have to offer. There’s so much that can be done to these bikes, but in the end, it’s still just a 200cc (give or take) air-cooled, 4-stroke engine from 1980. If you care more about traction than power, this is the engine to start out with. If it were me, I would start out with the suspension and get it set up for your weight and riding style. This goes for any year XR200. Some of you may have a head start with the late 80s forks and adjustable shock, but it still may be too soft. If you can’t ride through the woods without bottoming out all the time, more power will not make you faster. Once you get the forks and shock dialed in with the correct rate springs, oil, and damping changes so that they’re balanced, then you should move on to the go-fast modifications. An un-corked intake and aftermarket exhaust will produce a high percentage increase in power, but possibly at the cost of noise. If it still needs some more “oomph”, throw a cam and HC piston kit at it. Anything past that is going to cost hundreds or even thousands more. Why would I personally do these mods? Because I bought a 2002 XR200R to slowly build up for my single-track and billy-goat, mountain bike. This is my plan for a long-term bike build, and even with an almost stock bike, it’s still a blast to ride. For those that are crazy about making a lightweight bike even lighter, stay tuned for a future article on how to build a sub-200 lb. XR200 on a budget! When buying a used dirt bike, or any vehicle for that matter, you never truly know what you are getting. Just because the seller says it was rebuilt, doesn’t mean it won’t grenade on you an hour after you get home. You don’t know what exactly has been done to it, and they may not have rebuilt it correctly. Not everyone lies about what they have or what’s been worked on, but some people just don’t know. That’s why it’s YOUR job as a buyer to do as much research and scrutinizing of the bike as possible. The more you know about the model of bike you’re looking at, as well as the bike itself, the better you can judge its value. If you’ve never gone to look at a used bike before, asking a friend to come along that is very experienced with wrenching on bikes is highly recommended because they generally know what to look for. However, you can use this list of things to look for to give yourself a jump-start on bike mechanics 101. These guidelines relate to motocross bikes, trail bikes, 2-strokes, 4-strokes, air-cooled and liquid-cooled bikes for every make. “Just look at it” – Upon arrival, you can sometimes tell if a dirt bike is a cherry, or if it is a complete junkbox on wheels. Look at the plastic, frame, and over-all cleanliness of it. If it was put away wet often, there will be a lot of stains and dirt caked on the bottom of the engine/chassis. Look At Surroundings – This doesn’t pertain to the bike specifically, but while looking at it, take a look around. Where and how is the bike sitting? Is the garage/place clean? How does the seller’s other vehicles look? If everything is clean and looks well taken care of, there’s a good chance the bike was, too. This alone shouldn’t be the determining factor though. Frame Damage/Straightness – If the dirt bike has been in a major or numerous crashes, the frame or subframe usually shows it. Check for unusual bends/cracks at the welds or where two sections meet. If the subframe is bent, it’s usually easy to see by looking at the bike from the rear. The fender will usually lean more to one side. If it’s too far to bend back, a used subframe is anywhere from 50-200 bucks depending on the bike. Wheels – Take a close look at both wheels for bends or cracks, as well as missing spokes. If anything is damaged or missing then the bike was ridden hard or rode on rough terrain. Spin the wheels to see if they wobble at all. Used wheels in good shape can be expensive. Tires – Are the tires worn out or cracked from old age? If they don’t have any sharp edges then you’ll want some fresh rubber for a big increase in traction, which is not only safer, but it will put more power to the ground. A pair of tires can cost close to 200 bucks or more, depending on what kind of performance you’re looking to get. Suspension – You may need to get it re-valved for your weight, or it may just need to be serviced if the seller hasn’t done it in a while (or ever). This could be as little as new oil and a charge of nitrogen (rear shock). Bearings – There’s quite a few bearings on a dirt bike, and most of the time you can expect them to be needing new grease at the minimum. Move the wheels side-to-side to check their bearings. If there’s any slop they they need to be replaced. The steering stem has bearings and are usually under-greased from the factory. If it’s hard to turn the handlebars, they may need to be replaced. Swing-arm/Linkage – With the bike on a center stand, move the swing-arm up and down, as well as side-to-side. It should move freely without binding. If it’s rough or wobbles, it will need to be serviced and may you may need a new bushing kit. Air Filter – If the seller won’t let you take the seat/panel off to look at the filter, he/she is probably trying to hide something. If you’re looking for a good running and reliable bike, it’s probably best to walk away if they say “No”. If they comply, take a look at how clean the filter itself is, as well as the rest of the airbox. Someone who takes good care of their bike will keep these both clean. Engine/Transmission Oil – This is just as important as the air filter, if not more so! Most bikes will either have a dipstick or a sight glass so you can easily check the oil level. You should be able to see some oil at least at the minimum level. If you can’t see oil, there’s not enough to properly lubricate. If it hasn’t already, it will cause damage, and is one of the leading causes of blown engines. Many air-cooled trail bikes, such as the Honda XR lineup, is so reliable that some owners never change the oil. Eventually it will run low and will start smoking or seize. However, some dirt bikes require you to start and idle them for a minute in order to check the oil. Make sure you know how to check it before you go. Chain – Chains can last a long time if they are taken care of. On the flip side, if the chain is never or rarely cleaned and lubed, it can wear out faster than the top-end on a motocross bike. Check for kinks, as well as how far it is on the adjuster. If there’s no room left for adjustment, it’s because the chain is stretched out and is in need of replacement. If the chain has a lot of corrosion or skips at all, it’s toast. Sprockets – Sprockets usually wear with the chain. You can often get one rear sprocket, and two front sprockets out of the life of a chain if properly maintained. Look at the teeth for any chunks missing or odd shaped teeth from wear. Brakes – Look at the brake pads for wear. If they’re close to the limit marks or metal, they need to be replaced. Also take notice of the brake fluid in the master cylinder(s). If it’s low or dirty, it may need to be flushed out. Most of this is just maintenance, though, and isn’t too costly. Coolant – Pop the radiator cap off and check the coolant level. It should be at or near the top. If it’s low then the engine may have overheated and spit some coolant out the overflow tube. Radiators – After you look at the coolant, take a closer look at the radiators. Are they smashed or bent? How do the fins look? If it looks like it’s been poorly repaired or patched up, you can count on needing a new one, which can be expensive, depending on what you get (new/used/aftermarket). Handlebars – They can get bent easily if the bike was flipped or wrecked. You can usually tell just by looking at it, but by a simple test ride you should be able to feel if they are bent or not. Aftermarket handlebars often means that the stock ones got bent, along with the possibility of other parts in the process, so pay close attention if so. Levers – Brake and clutch levers are very easy to bend/break. They are fairly inexpensive, but if more than one needs replacing, the repair bill quickly adds up. The shift lever and rear brake pedal can get bent as well. Make sure the shifter is on tight. If it’s sloppy, the splines are probably worn and it’ll need a new one. Seat – Does it have any rips? If the cover was replaced, was it put on correctly? This has little to no mechanical function, but some of us like our dirt bikes looking nice. Fork Seals – Fork seals are cheap and fairly easy to replace with the right tools. However, it can be time consuming, and is quite spendy to have a shop replace them. If they are barely seeping, you might be able to get away with just cleaning them. Engine Noises – Start and let the engine idle for at least a minute. Listen for any rattling or ticking. If it’s a 4-stroke and it ticks with the RPM of the engine, it’s probably a worn timing chain or tensioner. Fairly simple fix on most bikes. If there’s a rattle that gets noticeably quieter when the engine is fully warmed up, it may be piston rattle, which will require a rebuild. Transmission – The best way to test the transmission is by riding the bike and shifting through all the gears. It should shift easily up and down through all the gears, with or without the clutch. If you hit a ‘false neutral’ in between gears, it may have a bent shift fork, which requires the cases to be split (a lot of labor). Clutch – You can test the clutch while you’re riding as well. How big is the ‘friction zone’ or how much movement does the clutch lever have from disengaged to engaged? Or does it even fully engage? A slipping clutch will rev out and the engine may feel really low on power. You can try dumping the clutch while in gear to see if it slips or engages and stalls. If it stalls or quickly goes to the correct RPM then it probably won’t need to be replaced. Exhaust – Look at the head pipe for dents or bends. If there’s any major damage, you’ll want to get it repaired or replaced. A crushed pipe will be lacking power. Also listen to the exhaust note. You can usually tell when there is little to no muffler packing because it’s loud and raspy. A freshly packed silencer is relatively quiet (depending on the specific silencer), and will sound nice and crisp. Packing is pretty cheap, but it’s not very fun to replace. Carburetor – You’re probably not going to be able to internally inspect the carb, but you can get a good idea on how dirty it may be when trying to start it and riding it. If the bike is hard to start and/or has a bog down low, there’s a good chance it will need to be cleaned. This is often the case if the dirt bike has set for a number of months (or even weeks). Recalls – If you’re going to spend a lot of money on a dirt bike, you might as well get to know your stablemate beforehand. Fortunately, it’s easier than ever these days with the internet. Do some research on the specific make, model, and year of the dirt bike you are looking to buy. Every bike will have common problems after years of use, and while some may cost more to fix than others, you can save money in the long run by planning ahead if you know that your particular bike may need a special part or ‘fix’ in the future. I know all of this may seem like a lot to take in right away if you’ve never looked at a used dirt bike, but it gets a lot easier the more you do it. Like I mentioned above, it’s a great idea to have a knowledgeable person with you to help. Also, do not be afraid to walk away from a bike. Everyone may say that they have the nicest and fastest bike, but if you want a clean and reliable dirt bike, it’s better to wait than wasting your hard earned cash dollars on a pile of junk that’s going to sit in the corner of the garage after blowing up on your first ride. Step by step tutorial on how to replace fork seals on a conventional damper rod dirt bike fork, specifically the TTR125L. Special tips including a homemade damper rod holding tool. This is a common symptom for both two and four stroke dirt bikes. Unless you are riding in extreme climate, your bike shouldn’t take more than a few kicks to get started. Certain bikes require more muscle and/or technique to get started, but a solid running engine will only take 1-3 kicks to start, hot or cold. On the flip side, just because your bike takes forever to start doesn’t always indicate a worn top-end. For more info on a ‘no-start’, read this article on Diagnosing A No-Start. Does your dirt bike feel like it lost its power-band(sarcasm)? A worn piston/ring will make the engine feel weak and low on power even when WOT (wide open throttle). This often happens after a top-end has so many hours on it, and will get worse/less powerful over time. A 2-stroke piston can last over a hundred hours if the bike was casually ridden and properly maintained, but an aggressive motocross racer can wear out a top-end in less than 20 hours of ride time. How often are you replacing the spark plug? If you have to put a new one in every ride, stop and inspect before riding again. If the jetting is right, a fouled spark plug can also be caused by a bad top-end or blow-by from the worn piston/ring/cylinder. This definitely indicates a new top-end is required, as well as a new spark plug. I have personally seen a CR80 that fouled plugs because of a bad top-end. It turned out that the piston was cracked and it eventually just lost compression. The cylinder was used again because it was surprisingly still in good shape! Here’s some more causes of a fouled plug. 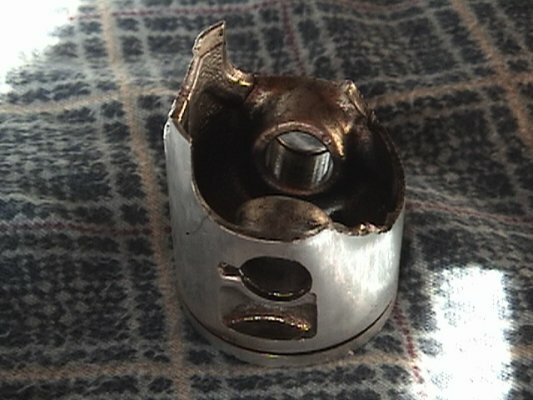 A scored piston or cylinder can be caused by multiple things. A lack of lubrication from not enough 2-stroke oil in the gas or lean jetting can damage the piston and cylinder, as well as the crank assembly and bearings. Scoring is caused by metal to metal contact, which is common on 2-strokes when they aren’t warmed up properly. It makes me cringe when people try to warm up their dirt bike too quickly, and I see it quite often. A lot of top-end damage is done if you start your bike and immediately ride it hard or rev it without giving it enough time to warm up. A piston has a certain amount of clearance between it and the cylinder wall. This clearance is for “growth”, because it will get bigger as it heats up. The size difference isn’t much, but if the piston heats up too quickly, it will expand faster and get too big to properly fit in the cylinder bore, thus creating scoring, and possibly a “cold seizure”. Read the article in the link above to learn how to warm up your dirt bike without damaging anything. You should also note that forged pistons, as opposed to stock cast pistons, are slightly smaller in diameter and require more warm-up time to expand; so take extra precaution. You may have to take the cylinder head off to get a good look at the cylinder walls to check for scoring, but there’s a quick and dirty way to give you an idea of its condition without touching the engine itself. Just unbolt and remove the pipe/expansion chamber so you can look in the exhaust port of the engine. Shine a light in there and see if there’s any noticeable scratches. You can look at the piston as well, but any scratches/scoring that looks like something you can feel with your finger nail is damage and will most likely need repair/replacement. If you can’t see the cross-hatching on the cylinder walls then it is worn and probably out of spec. If you don’t know already, this isn’t a good thing. While most 2-strokes are easier to kick over than a four-stroke dirt bike, you shouldn’t be able to push the kick-start lever down with one finger. If it kicks over with next to no resistance, the top-end is probably down on compression. Low compression will usually go hand-in-hand with taking a lot of kicks to start, as well as a weak engine. A new piston ring may be the only thing that needs replacing if the piston and cylinder are still in good shape. Rings only last so long and eventually go out of spec (refer to your manual). If you have the cylinder off, check the ring gap with gauges and compare to what the manual says. If the gap is too big, replace the ring with a new one. You can usually re-ring a piston once before needing a new piston as long as everything else checks out. These tips are only guidelines. Nothing is set in stone, as every bike is different. Just because your bike is hard to start doesn’t mean it will always need a new top-end. It could be something completely different, such as a dirty carburetor because the bike hasn’t been started for months. I put this list together because these are the most common symptoms of a bad top-end when all of the simple problems have already been checked. Have fun, and ride safe! Motocross Hideout includes anything dirt bike related, even if it is ridden on asphalt. So, just what is a Supermotard? Yep, a dirt bike with sport-bike style wheels and tires for riding on the street. If you’ve ever ridden a dirt bike on the street, you’ll know how exhilarating it can be when you whack the throttle and the front wheel comes off the ground. Motards are the ultimate hooligan bike, and can get you into a lot of trouble if you don’t follow the rules. However, if you want to legally ride on the street or go to track-days on a road course with your dirt bike, here’s some things you will need to replace or install. If you want to convert your dirt bike to a supermoto, you’re going to need ‘Sumo’ wheels and street tires. 17 inch wheels, front and rear, are the most common for supermoto, and are much better for street riding than the stock 21/19 that are stock on most full-size dirt bikes. They lower the bike, they handle better, and they’re wider so you can lay more rubber down. 3.5″ width is typical for front supermoto wheels, and 4-5″ are the most common for the rear, with several in between. You can go wider or narrower, but you may run into tire width issues, as well as the wheel being too wide and rubbing on the chain and/or swing-arm. Tire size selection is important in order to make your motard ride right. If you have a rear tire that’s too wide, it can actually hinder the performance. For example, if you have a 4.25″ rear wheel with a 160/17″ tire, the wheel will be pinching the bead of the tire because it is wider, thus creating a more extreme profile with a smaller radius, and ultimately less road surface. However, if you put a 150/17″ tire on the same wheel, it will have more contact surface on the road and perform better than the wider tire. This is research that you should do for your specific year and model bike to determine what combination is best. There is also the more extreme route for those that have the machining ability and want to possibly save a few bucks. Street bike wheels from certain bikes can be retrofitted to work with your dirt bike. However, there is usually machining involved to make clearance to fit on the swing-arm and/or forks. Bearings are fairly easy to swap out, but you’ll either have to find wheels with the same size bearings as your dirt bike to fit the axle, otherwise you have to buy some bearings with the correct size inside and outside diameters. Another problem that may come up if you choose to do this conversion is mounting the caliper. This depends on what size rotor you’re going to use, or if you want to put the stock caliper on the wheels you’re using. I can’t recommend a certain set-up for everyone, as there are so many different bikes and combination of wheels. Unfortunately, that is where YOU will have to read-up on as well. I don’t recommend going this route unless you are mechanically inclined and have the machining capabilities/resources. Lastly, cast wheels are not as strong as spoked supermoto wheels, and they will not be able to withstand the abuse of jumping and off-road riding; just something to keep in mind as well. Lights are required if you’re going to ride on the street. Every state is different, but the usual requirements are a headlight (hi/low beam), tail-light/brake-light, mirror, turn signals (hand signals are OK in some states), and reflectors. Headlights are fairly easy to install if you carefully read and follow the instructions (I know, that can be hard for the guys…). However, if you are using a motocross bike, you will either need an alternate or bigger power supply. An upgraded or rewound stator is probably the easiest way to go because that alone will power the lights. You’ll need to get a regulator to go with it so you don’t burn the lights out. Unfortunately there’s not an aftermarket stator for every dirt bike, or at least one that’s reliable. Another easy way to get usable lights for your street legal conversion is with battery power. You can buy an aftermarket lighting system for most bikes, such as the DRC EZ electric wire kit. It is powered by a battery pack of 8 AA batteries that are easy to swap out. They will last several hours, depending on how many lights you have and what kind of wattage they pull. Another option would be using rechargeable Lipo batteries, such as ones used in RC planes and cars. They should be 12 volt (4 cell) to match the lighting system. This route requires a little more initial cost, but being able to recharge the battery makes it easy, especially since you don’t have to worry about carrying around a bunch of small AA batteries. In order to go faster, you must be able to stop faster. If you’re converting your dirt bike to ride on the street or asphalt, you will want to upgrade the front brake. The rear brake isn’t as important because it’s not doing as much braking, so it’s adequate for most riders unless you’re highly competitive in supermoto racing. The brake-system is fairly simple in regards to modifications. You have the master cylinder, brake line, caliper, and rotor. The quickest way to get more braking power is by replacing the rotor with a bigger one because it produces more leverage. 320mm is a popular rotor size for motards to have, but there’s some things you’ll have to consider. Most bikes can use the stock caliper with a larger rotor, but the stock location will not work. This is why you must buy a relocation bracket in addition to the rotor. Be sure you buy the correct bracket, though, as the size/brand of rotor and caliper may vary. Calipers with four or six pistons are a common upgrade, as this will also produce more stopping power. A steel or aluminum braided brake line is a fairly inexpensive accessory to your braking system, and they perform better than the stock rubber hose. They are built to withstand more pressure, and give you a more consistent and less “mushy” feel compared to stock. Upgrading the master cylinder can get expensive, but if you are racing and want the most power with less effort, a better Master will complete the package. There’s quite a few options out there to choose from, and generally, you get what you pay for. On the flip side, many riders on a budget find an MC from a different dirt bike, street bike, or even a quad that is better than what they already have. Remember to do some research as to what works with your specific bike if you decide to upgrade. Last, but not least, are the ‘accessories’ that you must add to your motard to make it “street legal” and pass inspection if needed. Every state is a little bit different, so I will just hit the basics on what’s required. Almost, if not every, state will require a working horn. This doesn’t have to be anything fancy. In fact, a lot of riders buy a cheap bike horn from wal-mart. Turn signals may or may not be required. Hand signals are legal in some states. Most states need a headlight with a hi-low beam headlight, as well as a working tail/brake-light that works with the rear brake. Reflectors are a good idea, whether they’re required or not. It will make you a little easier to see, and if you get pulled over, the deputy may take you more seriously if you add little safety things like this. You will likely need a mirror to be legal, so a simple handlebar mounted or bar-end mirror will work. A road-legal exhaust is a good idea if your bike is being inspected. Most dirt bikes have “For off-road use only” stamped on the stock exhaust, which isn’t going to fly if a cop scrutinizes your motard. Also, bikes that carry passengers must have an appropriate seat set-up and passenger pegs. I know that supermoto’s are solo-bikes 99.9% of the time, but it’s just something else to keep in mind. Now it’s time to start building your bike! All of these parts add up quickly, which is why properly set-up supermotards (especially when plated) are so expensive to buy used. You probably won’t get your money back when you go to sell it, but it can be worth the money to know that you built it with all of the parts that you want. If you do some shopping around and have the whole winter to piece your bike together, you can find some good deals on used or even new parts. Besides, if you buy a complete supermoto kit for your dirt bike, you can always go back to the stock set-up if you want to ride in the dirt again. If you have any questions, either post a comment below or click the Contact tab above and shoot me an email. Have fun building your own Supermotard, and ride safe!